Giving customers an incentive that they can use towards every day purchases is a wonderful way to boost sales conversions. 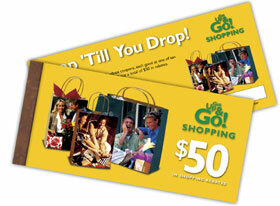 Our shopping booklets contain vouchers than can be redeemed for day-to-day purchases at a variety of popular stores. Each voucher comes in a preset denomination. Customers send their receipt of purchase along with a voucher to a provided address and a check is mailed to them. Sold in Lots of 25. Volume discounts available; call for more information!